What Color Are Your Christmas Flowers? ‘Tis the season to deck the halls! What colors have you chosen to make your home holiday ready? For some, it’s the traditional hues of red and green that makes Christmas feel right. Others will seek a more modern vibe through unconventional colors. Love pink? Embrace it and pair hot pink with silver or gold or both! It’s your Christmas and you need to feel good about the colors that surround you during the holidays. And that goes for your Christmas flowers too. Fresh flowers make us feel good and they look beautiful, so go ahead and add them in as part of your holiday displays. Christmas flowers come in all kinds of colors and forms from festive table top centerpieces, to fanciful Christmas arrangements to elegant bouquets! With floral designs ranging from traditional to modern, simply choose your style and colors and let an expert florist help you effortlessly incorporate Christmas flowers into your holiday decorating. If red and green is your thing, nothing says Happy Holidays like red poinsettias! Place a table runner on the dinning table, side board or counter and group three red poinsettias together for huge impact. The showy poinsettia blooms along with their large green leaves and sturdy stems add a great dose of red and green into your home. Want red to be the predominant color? Use long stemmed red roses in a tall vase for a classic yet elegant look. 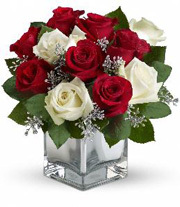 If you love red and white together, consider the Snowy Night Bouquet by Teleflora with red and white roses in a cube vase. Simple and stylish floral designs are soothing to come home to during the hustle and bustle of the season. Love green? 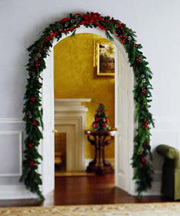 Use lots of greenery on the mantle paired with gold or silver ornaments in shiny or matte. Ask your florist for pale green flowers or if you dare, try some spunky lime ones. If blue is your go to color year round, (everything from jewel toned peacock blue to baby blue to sky blue), use it for your holiday displays too. You can mix blue with white, silver or gold or both metallics. White flowers can be incorporated into the blue theme by placing them in a blue vase or wrapping a clear glass vase with coordinating blue ribbon. Pink adds a pop of color to your holiday displays and a grouping of pink orchids next to a snowy white bowl of silver and gold metallic ornaments can look current and fresh. However, if all this talk of color is too much of a commitment for you, try classic winter white hued flowers. White will always look just right in your home. Just remember that there are no rules about the colors to use when decorating for Christmas. Just follow your heart and decorate with whatever colors lift your spirits. For a cohesive and consistent look, simply carry your color theme throughout your decorating and onto the tree. 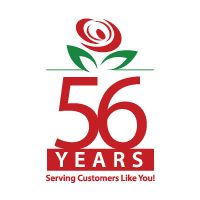 Don’t forget, a florist can help bring clarity to your holiday color vision with fabulous Christmas flowers. The images of Christmas we are most familiar with include bouquet arrangements of rich red and green missile toes. This may prove to be a problem for those who do things at the last minute because poinsettias are so common, the local florist may run out of supplies. 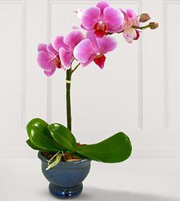 I didn’t know pink orchids could be appropriate for the holiday season, but since a florist has deemed them ok to include in your holiday decorations, I can totally picture a female celebrity like a Kim Kardashian using these to decorate an elaborate setting at her home family Christmas party. In any case, I’m glad to learn there are more color and flower options other than the traditional red and green arrangements. At least we have other options should there be a dearth in supply. This was very informative, and I appreciate the fact that you pointed out that you don’t have to stick with the traditionally colors for Christmas decorations and they will still be beautiful. If you had to stick with traditional then you wouldn’t have colored trees like pink, blue and even purple. I love the darker colors for Christmas, like burgundy, dark blue and dark green with silver and white highlights or maybe some gold. What would you suggest for that kind of arrangement? Last year I used browns and coppers and golds because it matched the colors in the living room where I was putting the tree so it worked out really well. I really love your advice on flowers of choice in your article, you always have some really cute ideas and I think you do a great job with your arrangements, I loved your blog on the keepsake arrangements and I hope that you post some more for the holidays. This was a very interesting article I never thought about my favorite flowers as Christmas flowers but you are right, why not? My favorite color is Purple so I guess my Christmas flower would be purple as well. What kind of arrangement would you suggest for purple flowers, because there really aren’t very many in the winter so they could be hard to find right? I was thinking maybe a deep purple with a dark green and some silver accents, what do you think that would look like? If you happen to have anything like that where you could possibly post some pictures on your blog I would really like to see something along those lines. Again this article is full of great ideas and you never cease to amaze me with the artistic imagination that you have. I really enjoyed your post, I love flowers at all times of the year but Christmas is really nice. My favorite color is blue though so I don’t often have any Christmas arrangements that have blue in them. Have you ever made any? What flower did you use that was blue, because I have a heck of a time finding any. If you happen to have any pictures I would love to see them.